Are you experiencing sadness? Anxiety? Facing a transition? Having relationship trouble? or Just feeling overwhelmed with life? I’d like to invite you to take the first step towards more peace and happiness in your life. People attend psychotherapy/counselling for many reasons from the loss of a loved one, relationship breakdowns, phobias, depression and anxiety, angers issues to needing to understand who they are. Often we become very limited in our perspective on problems, and have trouble finding the best solutions. Counselling provides you with the support and safety to explore and understand the difficulties in your life in confidence. What can I expect from a first psychotherapy/counselling session? The first psychotherapy/counselling session is about us getting to know each other a little bit and easing anxieties. Most people are anxious at their first meeting with a therapist. It is perfectly normal. Once seated in the therapy room, issues such as your confidentiality, safety, privacy, experience of therapy previously (if any), as well as the cost and frequency of therapy sessions, tend to be the topics first addressed. At this stage I may be doing most of the talking and so if you are still feeling anxious this gives more of an opportunity to begin to feel more relaxed. At any stage you are welcome to ask any questions you may have. I will give you some space to talk about what brought you to therapy. If we do decide to begin therapy together we can explore the options for beginning. If you feel you would like time to think about whether I am the right therapist for you, that is fine, and it is also OK if you decide that I am not the right therapist for you. The purpose of this exploratory session has been to make these kinds of decisions. I am an accredited member of IACP. 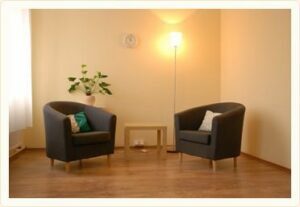 I provide psychotherapy and counselling in Dublin and online counselling for those in more difficult to reach locations. The initial session is offered at a reduced price.